Day thirty was special. I left for Pensacola around 8am. I wanted to see some of the military exhibits in this area. Traveling west on I-10, I found it was impossible to turn around, once I entered Alabama I drove another 50 miles and came on Mobile Bay. A sign directed me to Battleship Park. It was still early, so I was the only person there. 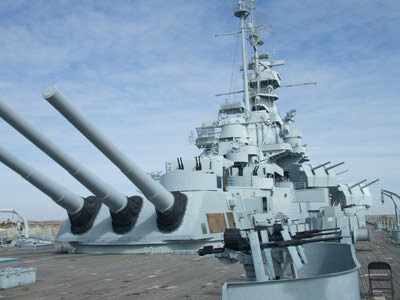 I bought a ticket to tour the Battleship Alabama. There was no tour guide. It was just me and this wonderful historic fighting ship. I walked up the long gang plank and started exploring things. I was amazed at the gun stations. This mighty vessel bristled with guns. I thought about my friends who were into gun collecting. They would have enjoyed owning the machine guns protecting the deck area. I wandered into the passage ways and went up and down the ladders connecting the decks. In the inner bowels of the ship I could sense the ghosts of the fighting men who once sailed this man-of-war. I was thinking about ghosts when a lady jerked open a door right in front of me. She scared the bejeebers out of me. Once I calmed down, I asked her to take my picture on the bow of the ship so I could be seen yelling, I’m king of the world. Later, I climbed up to the bridge. It was hard work and the ladder steps were steep. No wonder Navy has a goat for a mascot. You have to be a mountain goat to move around on a ship. After the climb, I was sure I was going to eliminate my daily walk after touring this battleship. It was on to Biloxi. I drove around the area to check out the Casinos. I was not going to stay at the Beau Rivage. I decided on spending a few days at The Isle of Capri. The room rates were $70.00 a night. I found the rooms to be nicer than the Beau Rivage. I went down to play some hold-em. I bought in for $100.00. There was only one seat open. Before I could sit down, one of the players asked if I minded if he sat there and I could take his seat, I agreed. He said my seat had given him rotten hands all afternoon. The first hand I got was a ace ten, An oriental guy raised it ten bucks. I stayed. The flop came ten,ten, nine. The chineman bet ten, I raised twenty. The man on my left raised twenty more and I went all in. It was my first hand and I thought he might have a ten nine in the hole and I would be out in one hand. He didn’t, and I won over a hundred on the first hand, I was really starting to like The Isle of Capri Casino. The game broke up and I moved to the Pow Gai table. I gave the lady dealer my player’s card and asked for some chips. She tossed my card back and said she was not in the mood tonight. I looked at the card and saw it was my room key. I kidded her and told her I had eaten oysters for lunch. She smiled and said, “No thanks.” I am having a good time at this casino and may stay for a couple more days. There are a few attached pictures. In one of them I am standing on the bow of the Battleship Alabama shouting, “King of the world.” The lady who took the picture laughed and said, “You look more like bum of the world.” She may be right. The King of the world would not keep bitching about how expensive the Beau Rivage was. 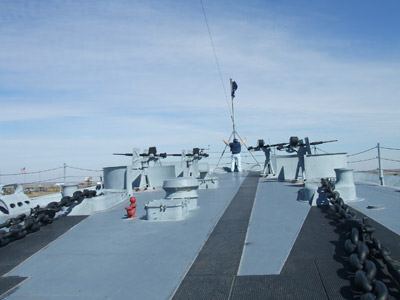 Guns on the Battleship Alabama.